Azahar, the coffee tree’s blossom, marks the beginning of every bean we roast and the search for Colombia’s best coffees. It represents our belief in the transparency of our relationships and in honoring the work and knowledge of each coffee farmer-all so that we can bring you a unique experience in the cup. Traditionally, Colombia has always exported its best coffee. Contributing to that tradition, we source ours from farmers all across the country and ship it around the world. But with a roastery in Quindío and a couple cafés in Bogotá, we do our best to serve as much of it here as we can. Because Colombia deserves to drink its best coffee, too. We combine a bit of science with the senses. We listen to what the producers we work with have to say, spending as much time on the road as we do in the lab. We travel year-round to some of Colombia’s smallest farms, even if it means going to areas that often don’t appear on the map. We deal directly with producers, co-ops and growers’ associations to make sure we are building transparent relationships with everyone involved. 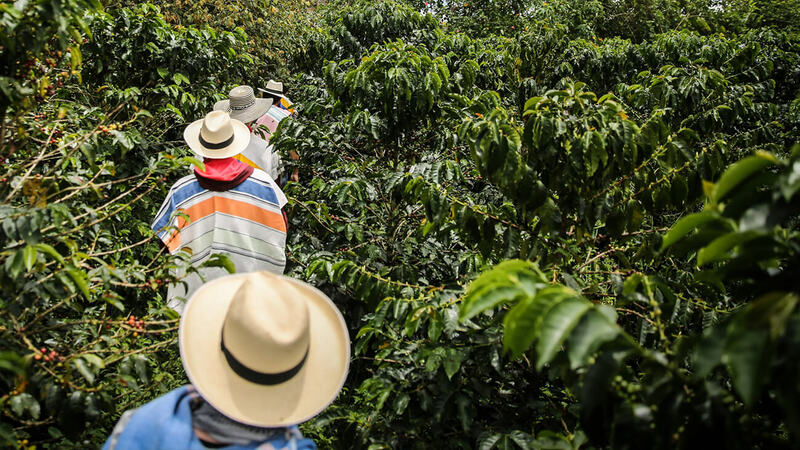 In exchange for farmer’s dedication to producing truly great coffee, we pay higher, stable prices, because regardless of what the market says, good coffee farming should be profitable. In the process, we establish enduring relationships. Every day, the coffee market price fluctuates based on the NY ‘C’ price, the exchange rate for the Colombian peso, and the “Colombian Differential” (the amount of cents per pound that the market is recognizing for commodity grade Colombian coffee). This price does not take into account farmers’ costs of production; yet it is the basis upon which all Colombian coffee is purchased. We believe this fails coffee producers. That is why we recognize and value quality and experience by paying higher, stable prices because regardless of what the market says, good coffee farming should be profitable. We export micro lots and regional blends sourced directly from producers. We believe in economic transparency and consistent quality in the cup, allowing importers and roasters to establish enduring, sustainable relationships with Colombian farmers. Through roasting we seek to honor the work of each and every producer, highlighting the individual profiles of their coffees. So, we try and caramelize the sugars of each one just enough, balancing brightness with body and sweetness to ensure an equally satisfying, yet unique experience in every cup. Let us know about you !